I have two main tree designs which can be altered to indicate different trees by changing the terminals and colour. (See also Thorn Trees) This one is based on a stone carving from one of the high crosses. I have made it to indicate not only a rowan (shown) but also hazel, ivy, apple, birch, alder, oak, mistletoe and holly. It is thought that the early Celts held trees in special esteem. 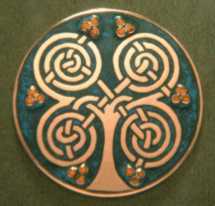 The druids were believed to worship in oak groves and many tribes had a tutelary tree called the bile. 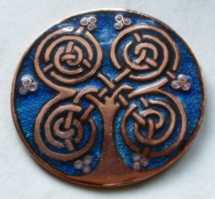 The letters of the Ogham alphabet and the months of the Celtic year were named after trees. 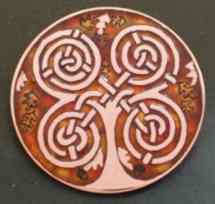 Rowan is the tree of life, the quickbeam. It was a tree of protection and of quickening. It was put to oracular use, probably from very early times, since there is an especial abundance of rowan trees around megalithic monuments and other sacred places. Its Gaelic name is Luis. Apple is the tree of hidden knowledge and immortality. King Arthur goes to Avalon (apple land) to be healed of his wounds. The Irish Bran is summoned to the otherworld with an apple branch. Ossian follows a girl with a golden apple to the Land of Youth. 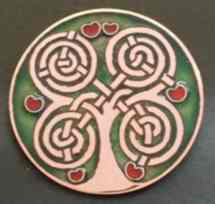 Apple shares the 9th month with hazel (which is the tree of revealed knowledge). Its Gaelic name is Quert. Oak was the tree of midsummer. 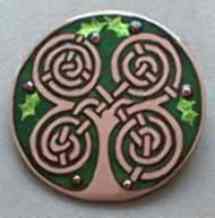 the gateway tree, the tree of coming and going. An oak tree is more likely than any other tree in the forest to be stuck by lightening and is for this reason often thought to be a tree of power. The English word for door is thought to be derived from its gaelic name, Duir. Mistletoe was not a tree, but its folklore was included in tree mythology because it was parasitic on the oak – an especially sacred tree.. Caesar tells of druids cutting mistletoe boughs with a golden sickle for ritual purposes. It was thought to be sacred to the moon goddess because of its white berries. It is the tree of the winter solstice. Hello, I have a request. The Rowan Tree was very special to my parents and I am currently designing their gravestone. They are buried in a beautiful old family graveyard in the west of Scotland by a Loch. 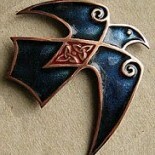 How would you feel about me using your Celtic design if the Rowan Tree to help the stonemason. It is just perfect. Since the rowan tree design doesn’t belong to me (it’s traditional – from a high cross, where it was originally carved in stone!) the answer is yes! I have just completed a monument for my parents, so I understand how you feel. Please do post a picture of it here when you are finished. And thanks very much for asking. Thank you so much for your reply. May I ask where the stone high cross was? Sounds interesting. I hope you were pleased with your parents monument, such an important thing to get right for them. Thank you. I was very pleased with it! This entry was posted on July 18, 2013 by imagocorvi in champleve, mythology and tagged apple, celtic, holly, misteltoe, oak, Robert Graves, rowan, The White Goddess, trees.